During the month of March, we celebrate National Nutrition Month® by focusing on the importance of making informed food choices and developing sound eating and physical activity habits. One area many people tend to fall short in is eating their daily requirement of vegetables. One way to meet this requirement is to eat more plant based meals. Here is a satisfying, flavorful vegetarian meal that’s ready in less than 30 minutes! Brown rice contains more fiber than white rice and provides a nice chewy texture to the stir-fry. Prepare brown rice according to package directions. Set aside. In a large skillet, heat coconut oil over medium-high heat. When oil is hot, add tofu cubes carefully. Cook for 2 minutes, then flip tofu to another side. You can remove the pan from heat while flipping tofu to avoid oil splatter. Cook tofu on at least 4 sides for crispy texture, cooking for 2 minutes on each side. Once cooked as desired, remove tofu from pan and set aside. Using the same skillet, sauté bok choy over medium heat for 2 minutes. While bok choy is cooking, combine tamari, agave nectar and sriracha hot sauce (if using) in a small bowl. 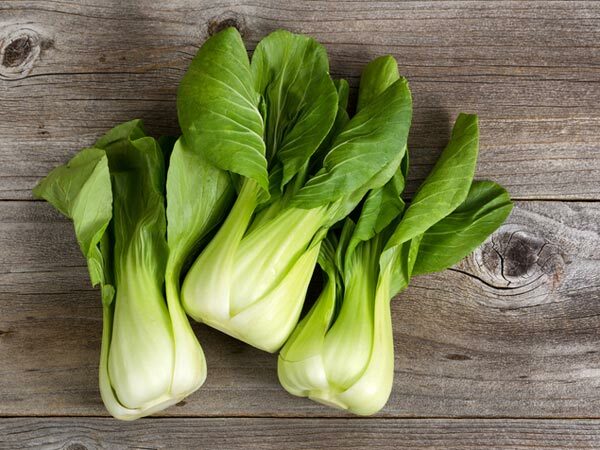 Turn heat off and add sauce and cooked brown rice to skillet with bok choy and stir together. Add in tofu cubes and mix together briefly to maintain crispiness of tofu. Top with green onions and serve. Cooking Note: If not using coconut oil, olive, canola or sesame oil may be used as substitutions.